Whether Beach Cove Resort is your usual vacation landing or you are taking your first plunge into the Myrtle Beach experience, you will find there are always new attractions and events to keep this beach side town buzzing with fun. Go Ape is the ideal outdoor adventure park that is no more than 15 minutes from your stay at Beach Cove Resort. There you may expect to find more than your average tree top adventure. Their plethora of activities includes: Spiders Web, Zigzag Bridge, Flying Carpet and Jungle Crossing, 2 Tarzan swings and 5 zip lines. North Myrtle Beach Park and Sports Complex is where you will find Go Ape to give your family the opportunity to have fun, conquer fears and engage in physically challenging obstacles. Duplin Winery has sprung out of Rose Hill, North Carolina and leaped into North Myrtle Beach. You will soon be able to enjoy 15,000 square feet of North Myrtle Beach's wine hub featuring sweet, fruity and dry wine tastings to be enjoyed by visitors. Duplin Winery will be located seconds from Barefoot Landing which makes for an ideal location of sipping to go along with fabulous restaurant choices surrounding it. Whether you can sneak away for a couple’s night out or are planning a special occasion get away, be sure to put this place on your itinerary. 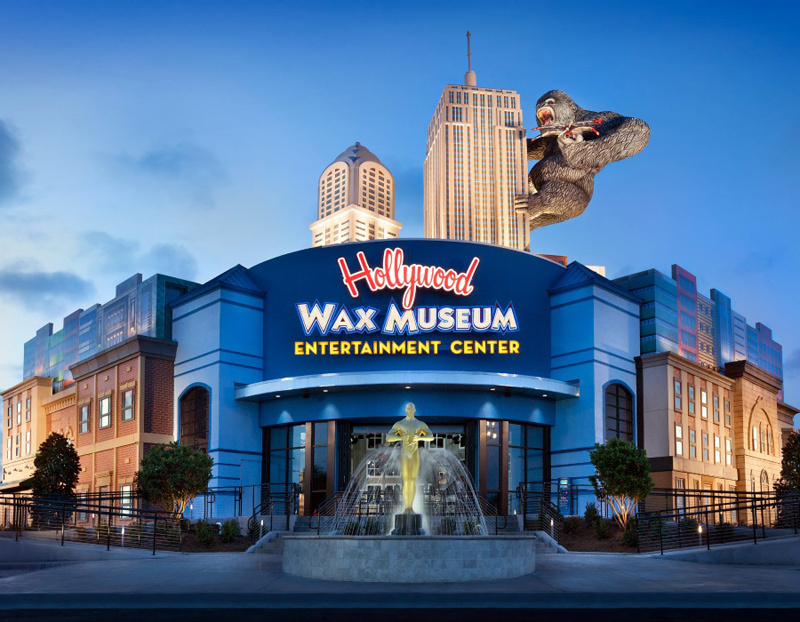 Hollywood Wax Museum is the new favorite and must-see attraction in Myrtle Beach. You will find the museum across from Broadway at the Beach and you will not find it anywhere else across the southeast. Your favorite singers, actors, sports icons and more are waiting to greet you in their statue form. You not only get a photo op with your idolized favorites, but also get to gaze upon the intricate beauty of the perfectionist artwork that goes into creating a wax figure. An individual figure shown at the museum takes a team of artists around three months to create. Come see for yourself what all the hype is about! Bonus: Bring your VMB Card for $2 off the All Access Pass. These three attractions present just a peek at all of the new and classic Myrtle Beach entertainment favorites. Your family is sure to enjoy bounding to new heights at Go Ape, and peering upon their favorite famous people at the Hollywood Wax Museum. Save some fun for the Duplin Winery to make this the ideal vacation for everyone.